Pickup trucks as a market segment are among the best selling vehicles in Canada. The case for trucks in a rural area, or from a work perspective are crystal clear. However, what about those drivers looking for the best of both worlds such as, hauling lumber, gravel or plants for landscaping and home reno projects while still having the finesse and utility as an everyday vehicle for the family without breaking the bank? 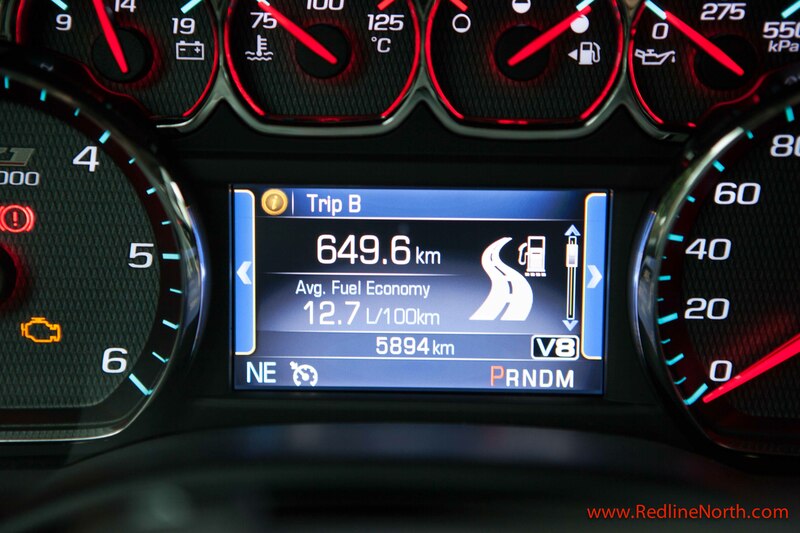 Well, the 2014 Silverado 1500 Z71 4WD LT Crew comes close to bridging this possibility of balancing these many needs. The Silverado with the crew cab comes with two box options, the newly available 6-foot 6-inch cargo box and the 5-foot, 8-inch box. 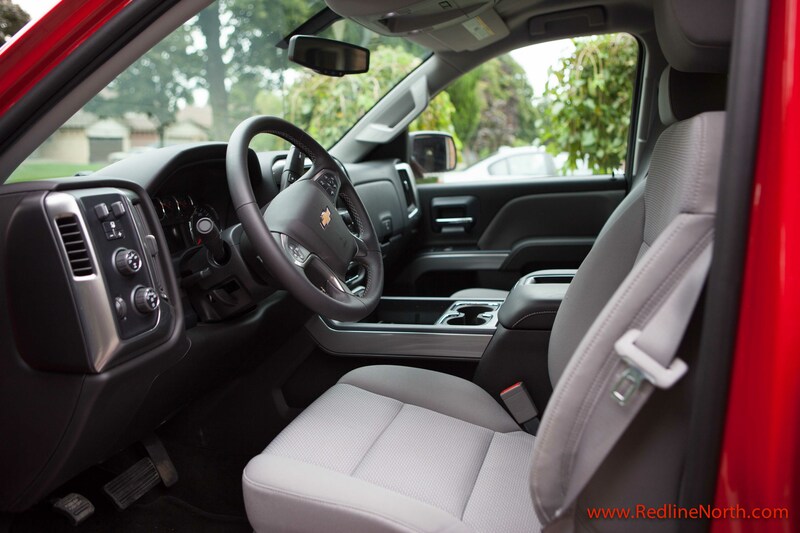 Opting for the 6-foot 6 inch box does bring the Silverado within a sliver of 20 feet long, however, the extra interior room in our opinion makes up to it. For those urban cowboys with families this means the ability to install three car seats with ease. Even rear facing seats that notoriously require additional space fit well in the back of the cab. The additional length, does make it a bit of a challenge to find suitable spaces in parking lots however, for many the trade off is likely worth it. 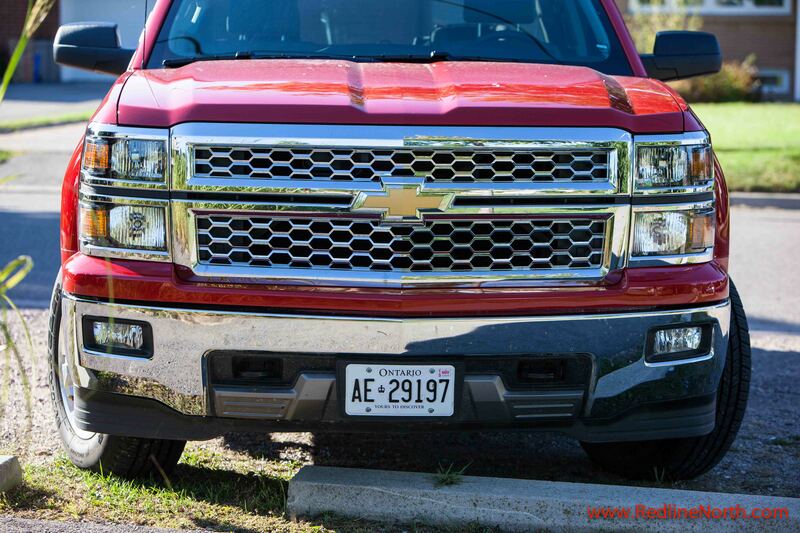 As mentioned, the Silverado 1500 comes available with many luxury features that rival sedans, such as rear back up camera, 8″ touch screen with satellite radio, heated seats, and a 12V and 120V accessory charging plugs along with three USB ports. This pickup truck is for more than just hauling lumber and tools from the job site. 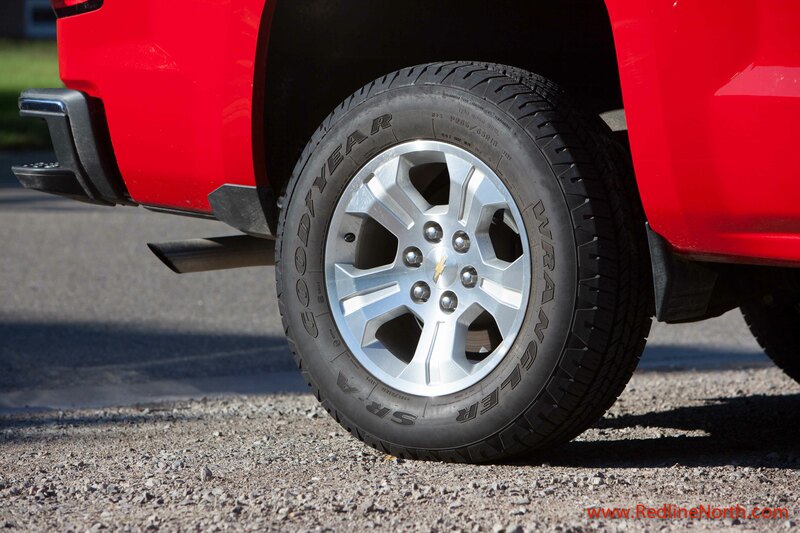 Additional stand out features of the 2014 Silverado include the supportive drivers seat, advertised as having all day comfort and we would have to agree; dynamic suspension that provides just enough rigidity when needed and flexibility when not, along with an expansive interior with inlaid triple-sealed doors, and a more aerodynamic windshield that acts to provide a very quiet cabin. 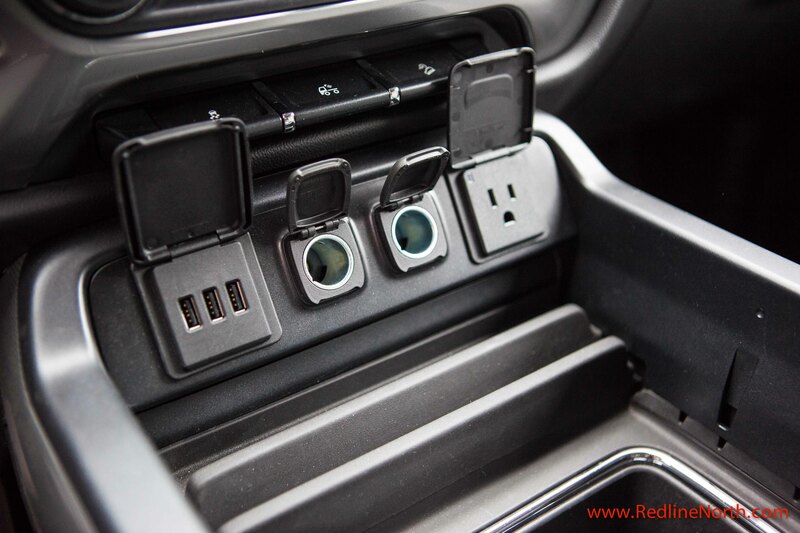 USB, 12V and 120V charging ports are a nice touch. The ECOTEC3 engine in the 2014 Silverado automatically switches from V8 mode to V4 mode when less power is needed during the driving cycle. The transition is seamless and the only way the driver can tell this is happening is by looking for the V8 or V4 symbol on the display. This technology translates into a rated fuel consumption of 13.3 liters City and 9.0 litres Highway with an estimated annual fuel cost of $2,941. 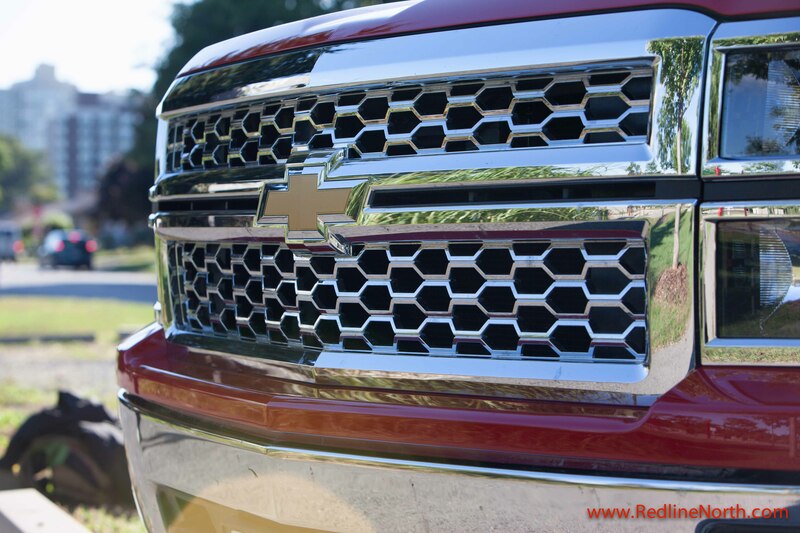 During our week with the truck, this was very close to what we experienced and we are pleased to see this innovative fuel technology being incorporated into the Silverado. The 2014 model year also provides some aggressive styling cues with its chrome front and side accents along with the dome hood. Sight lines in the cab are better than expected, although the rear camera is a needed accessory in our opinion. The CornerStep bumper and pocket hand grips in the tailgate are also a nice cosmetic and functional touch. 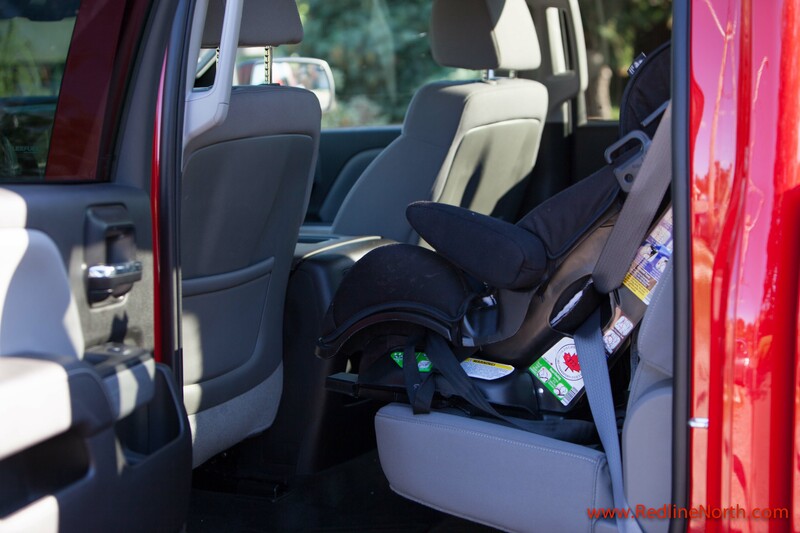 Interior storage space is more than plentiful for both front and rear passengers and driver. The 8 inch LCD screen offers plenty of screen space and uses GM’s MYLINK platform. While we are not always a huge fan of current in car infotainment systems, MYLINK does a reasonable job of providing required information and functionality with minimal hassle. The transmission in the Silverado was a little bit awkward at lower speeds, especially when shifting from first to second. When entering the highway you did have to hammer the acceleration to get all 355lbs of HP and 383 of torque to engage close to the redline, but when they did it was obvious there was plenty of power under the hood. Key competitors to the Silverado are the GMC Sierra 1500, Ram 1500, Nissan Titan, Ford F-150 / F-150 SVT Raptor and the Toyota Tundra. 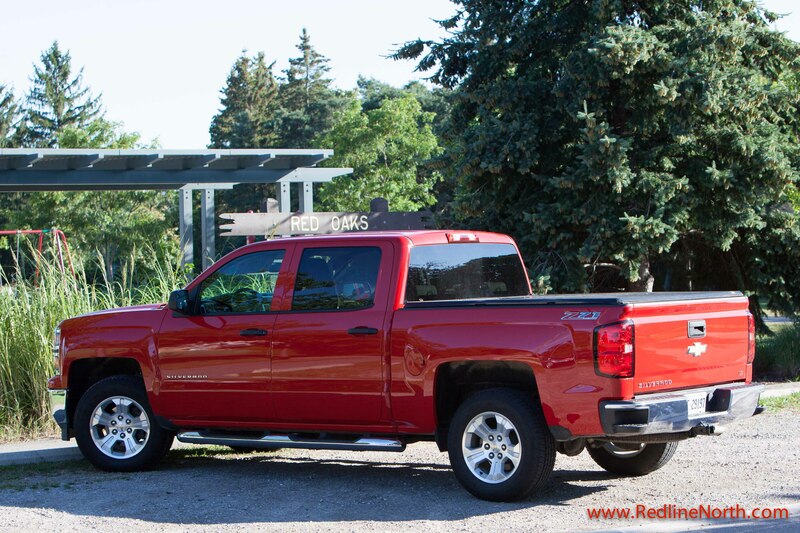 Even among this stiff competition the 2014 Silverado 1500 is worth serious consideration, and with the Z71 off-road and the special edition packages, the Silverado 1500 is hard to beat at its $48,835 CAD sticker price. 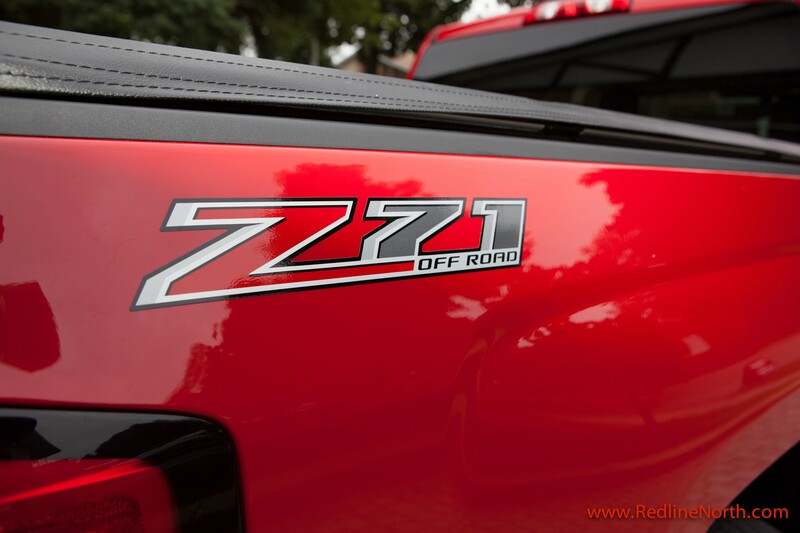 This entry was posted in News and tagged 2014 Silverado Z71 1500, Chevrolet, Chevrolet Silverado, Z71 by northredline. Bookmark the permalink.